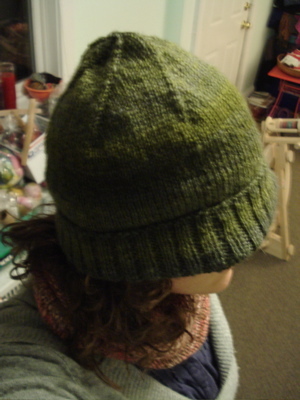 FO: handspun seaman’s cap (the fourth). 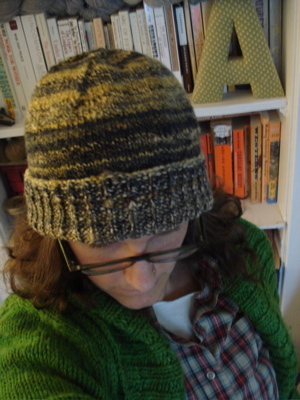 This is my fourth handspun seaman’s cap. Clearly, I love this pattern. 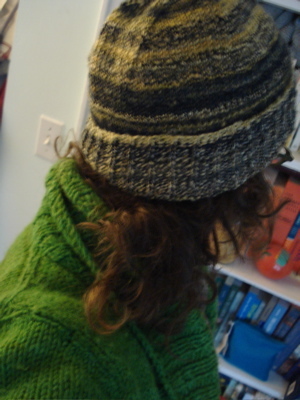 (Also, I love this hat, but this one is most definitely hopping into the mail this week so that my brother gets his Christmas present before it is too warm for super squishy handspun hats.) 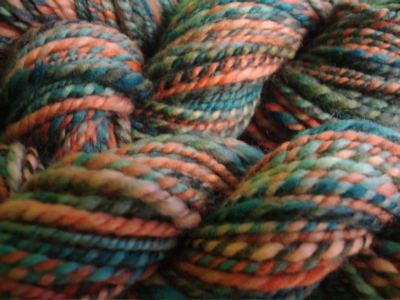 I knit the large size, and used 150 yards of handspun superwash merino from Crown Mountain Farms in the albatross colorway — which is almost exactly what I spun from the 3.5 ounces I estimated I’d need. Yay! I hope he likes it. Happy Monday, folks. Despite my whining, there is a lot to look forward to this semester. I was so excited about how this was looking that I stopped plying to grab the camera. 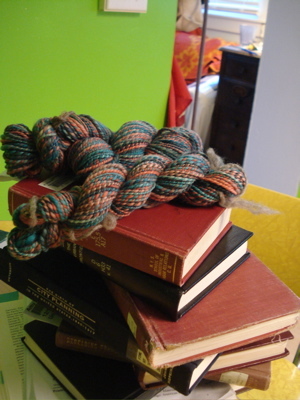 This is 170 yards of super squishy heavy worsted 2-ply from the second 4 oz. 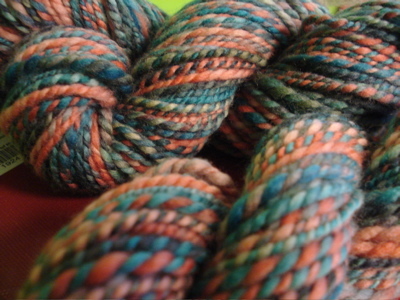 of Crown Mountain Farms superwash merino in the Lucy in the Sky with Diamonds colorway. LOVE. Love so much that I could set aside my writing and grading and cast on for mittens for me right now. But I’m not going to. Why? 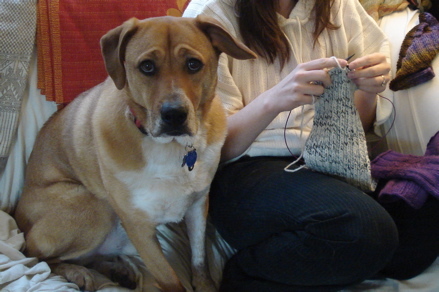 Because I don’t have to do what the yarn says all the time. Really. 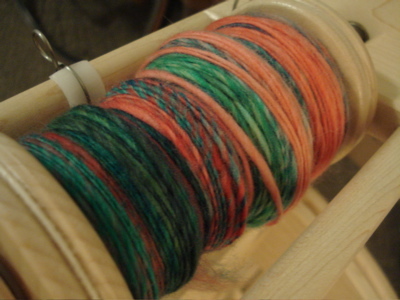 Which brings me back to my love affair with my wheel, and my decision last night to start spinning some FLUFF superwash merino in Beach Day. 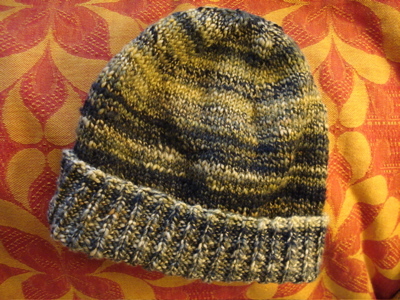 I think what I really need to do is swatch to see how the colors look all knitted up. 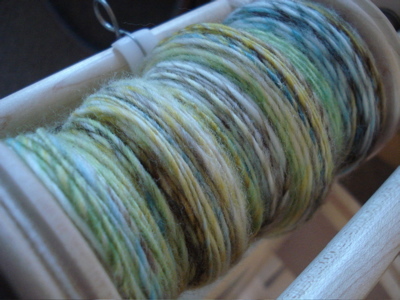 And keep spinning this bee-yoo-ti-ful FLUFF fiber. Oh, and keep writing. Perhaps in the reverse order. What’s the matter, big dog? Don’t be. 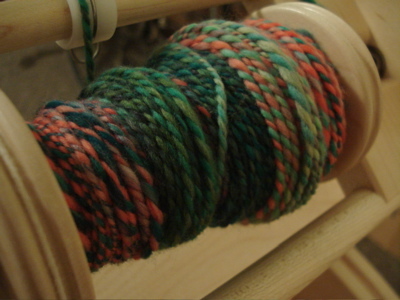 I’m not going to ply it with the first bobbin until I make sufficient progress on that other stuff. Really. And don’t worry, we’re still going to take a nice W-A-L-K today. “Pretend productive” is when you read comments you’ve received on drafts, track down citations, request books that you know you should look at from the library, rearrange the piles or files you’re working from…and then (and this is key) derive a false sense of accomplishment from these tasks — and stop working. I was “pretend productive” yesterday. I don’t really have pictures of what that looks like, but I think you get the idea. I do have pictures of fibery productivity, though. 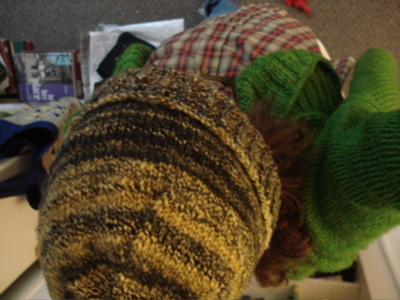 First, my friend H (you may remember her as the recipient of the purple ishbel/springtime bandit brokeknits mash-up wedding shawl) came over to make applesauce and do some knitting. Boh assumed his supervisory role, and did a very good job of keeping our feet warm. 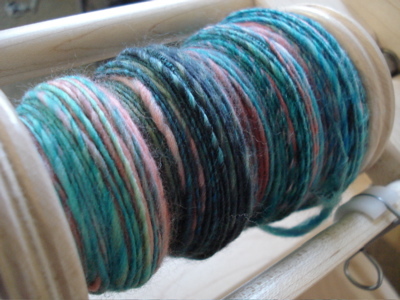 H. asked me to show her how my wheel works, and because I had emptied all of my bobbins, we had to decide what I would spin next. I decided on the second 4 oz. 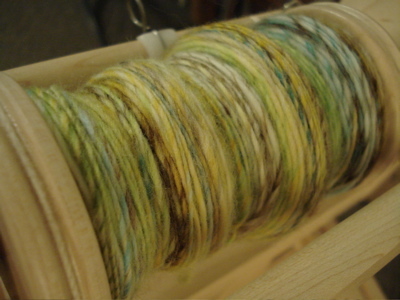 of Crown Mountain Farms Superwash Merino in Lucy in the Sky With Diamonds, spun as a fatter 2-ply. 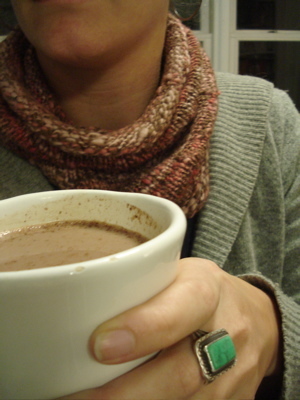 I started it to show H., and found it so captivating that late last night, I made myself a cup of hot cocoa and kept going. Boh and I walked down to the reservoir to stretch our legs and check out the fall foliage, and we were not disappointed. Making time to do this is important to me. There’s something about being in a relationship that made it easier to leave all of the work that piles up and prioritize spending time together. This fall, I’m really trying to make sure I take some of that time for myself. The weather this weekend was absolutely lovely, and I’m hoping for an October filled with cool mornings, crisp fall breezes, and clear skies. Boh likes to “hide” behind or underneath the blanket on my bed. He also likes to chew on it, or pretend to chew on it, as a way of getting my attention. Slow-roasted tomatoes and raspberry muffins. There was also applesauce — a lot of it — but I didn’t take any pictures. 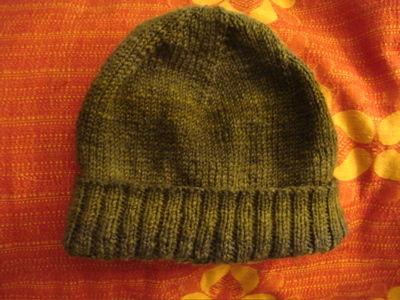 Oh, and some knitting! 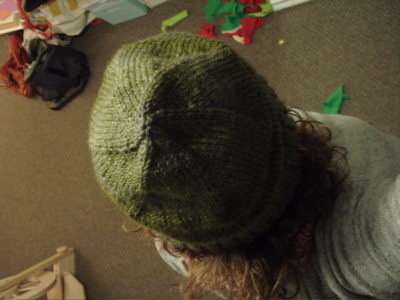 I am ready to start the decrease rows, and I am absolutely in love with this hat. I also adore this pastry cutter — a lovely surprise from a friend who found this at an antique shop and knew that I’ve been looking for a a pastry cutter with a wooden handle. I may have to make up a batch of pie crust to welcome this into my kitchen. 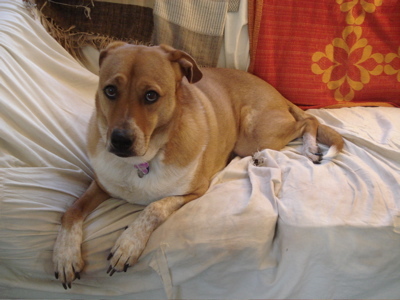 I think this is Boh’s “get back to work” face. 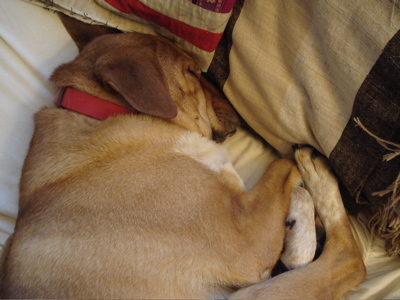 I never get tired of taking pictures of this dog while he sleeps, which is a good thing: he seems to be napping 90% of the time. Boh and I have big plans to catch up on reading/writing, tackle a big pile of grading, and make some knitterly progress on a few things this weekend. Happy Friday!